Can we expect some response from TOS addressing the serious accusations that have been leveled at its owners this week? 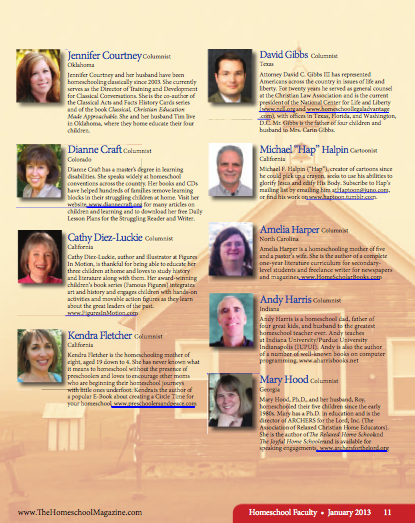 I have long endorsed this magazine to the more than 100 families in my homeschool group and as the group leader, I feel some responsibility to retract that endorsement if TOS isn’t going to deal with this issue honestly and publicly. TOS did not answer the question publicly. Rather, their customer service representative said, “Please email me at customerservice@theoldschoolhouse.com.” Another individual asked for an answer as well; that individual was also asked to email TOS privately. To date the Old Schoolhouse has yet to make any public statement about the serious allegations of abuse and misconduct by owners Paul and Gena Suarez and their son. Thank you for emailing us privately with your question. A more public response is not possible due to the agreement with the other party and ethics which state that when minors are involved broad publicity is not encouraged. 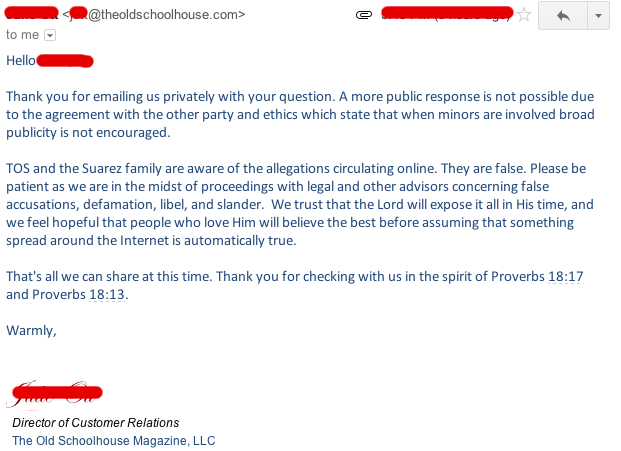 TOS and the Suarez family are aware of the allegations circulating online. They are false. Please be patient as we are in the midst of proceedings with legal and other advisors concerning false accusations, defamation, libel, and slander. We trust that the Lord will expose it all in His time, and we feel hopeful that people who love Him will believe the best before assuming that something spread around the Internet is automatically true. That’s all we can share at this time. Thank you for checking with us in the spirit of Proverbs 18:17and Proverbs 18:13. One thing is true: truth shall be exposed in due time. And I do not advise placing any bets on the side of the Old Schoolhouse. The response is self-contradictory. The first paragraph clearly admits there is “another party” with whom some sort of settlement agreement exists (and if they really did agree to confidentiality then they are violating the agreement by even communicating this level of information). Then there is some nonsense about “ethics which state that when minors are involved . . . .” A meaningless jumble of Gibbs-style lawyerese, but the essential point is that a minor is in fact involved. Then, paragraph two jumps up and down screaming that the allegations are false. Because, you see, the fait accompli was supposed to be that once the victim was browbeaten into a settlement that included a non-disclosure agreement then Old Schoolhouse was off the hook. They are furious that they weren’t able to hide behind that like they thought they could. I always wonder about the legalities involved when a parent signs a non disclosure agreement and later the child wants to speak out about what is their story, not the parents story. If they were false, my bet is they would have come out swinging as soon as this story hit the net. A delayed response in the face of these most drastic allegations seems to be one of denial and damage control. 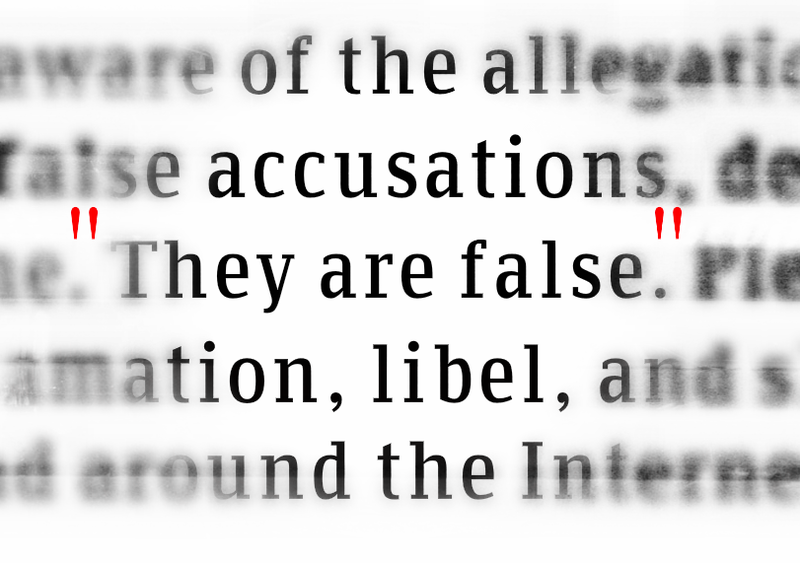 Note the allegations are “false” without saying what is false about them. They expect you to figure that one out. Obviously at least some parts are true. Ergun and David have threatened to sue me for defamation also, but will not explain where I slandered Ergun. I have offered to correct anything they can demonstrate, but they will not get anymore specific than “slander”. The irony among ironies is that David and Ergun lied and slandered me so much that the judge wrote at length in both the summary judgement and the fees judgement. Don’t trust David, he lacks integrity.